LED bulbs have been out for a few years but the last year has seen some improvements on their light output and price. While they are not a perfect product for every lighting need they are very good for many of applications. LED technology has made major improvements in design allowing for a very efficient light source. LED lamps are capable of great savings in cost over their life when compared with other bulbs. A 60 watt Edison bulb or 26 watt compact fluorescent can now be replaced with a 10 watt LED equivalent. In addition to its low cost to operate, the average bulb will last 30 to 50 thousand hours of use. Maintenance time is reduced as a result. LED bulbs do not contain mercury, in most, if not all brands this makes them much safer than fluorescent bulbs. Mercury is not a good thing to have in your home especially in bedrooms. For information on cleaning up a broken CFL bulb, check out our article How to clean up a broken CFL as instructed by the EPA. There are several color temperature options to achieve a desired look. We have used LED in recessed cans as a retrofit and they work great. There is a 14.5 watt LED made by Sea Gull lighting to replace the original trim and bulb that produces a good strong light. When compared to the standard 65 watt reflector bulb, we were satisfied with its light output. 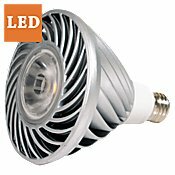 The LED should last 12 to 20 times longer than the standard 65 watt bulb. When you factor the cost of 12 standard bulbs, the LED replacement will save you money over time. They are great to use in fixtures that require large ladders to reach, due to their lifespan. We also use LED in landscape lights to save on the power bill and reduce maintenance costs for our clients.